1) Dravid completed his 1,000 runs in Tests in the year 2006 when his score reached 22 in the second innings. He became the first batsman to do so this year. At the end of this match, Dravid's tally in 2006 reads as 1,046 runs in 18 innings of 10 Tests at an average of 74.71 with three hundreds and seven half-centuries. 2) This is the second occasion that Dravid has aggregated 1,000 runs in a calendar year. In 2002, he had scored 1,357 runs in 16 Tests averaging 59.00. 3) Dravid completed his 9,000 runs in Tests when his score reached 19 in the second innings. He became the sixth batsman to do so after Sunil Gavaskar, Allan Border, Steve Waugh, Sachin Tendulkar and Brian Lara. 4) By taking only 176 innings to complete his 9,000 runs, Dravid also became the quickest in terms of least number of innings taken to accomplish this feat bettering Brian Lara's record who took 177 innings to aggregate 9,000 runs. 5) Dravid became only the fourth batsman to score half-centuries in both innings of a Test, in which no other fifty was scored for India. Others to do so for India are -- Vengsarkar against England at Leeds in 1986, Tendulkar against Australia at Melbourne in 1999-00 and at Mumbai in 2000-01. 6) Dravid achieved the two highest scores in the match. This provided only the seventh such instance in a Test, where all 40 wickets fell. He is the second Indian after Dilip Vengsarkar (102 not out and 61 against England at Leeds in 1986) to do so. 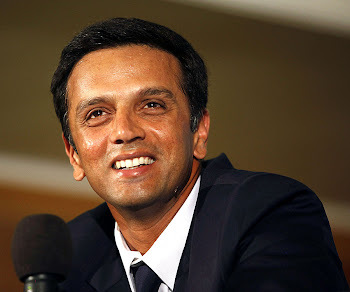 7) Dravid has now top scored in a completed innings on 17 occasions while playing abroad. This puts him at level with Tendulkar. Now only little master Sunil Gavaskar (18) has top scored in a completed innings on more occasions for India than Dravid. 8) Dravid's aggregate of 496 runs in the series is the highest by an Indian captain in an overseas series. He obliterated Sunil Gavaskar's record, who had aggregated 434 runs in six match series against Pakistan in 1982-83. The previous record of highest aggregate by an Indian captain away from the sub-continent was held by Mohammad Azharuddin, who aggregated 426 runs in five innings of a three match series against England in 1990.